Video highlights from Barrie Colts 7-5 Win over Erie Otters. #OHL - Very Barrie Colts | A website covering the Barrie Colts of the OHL. 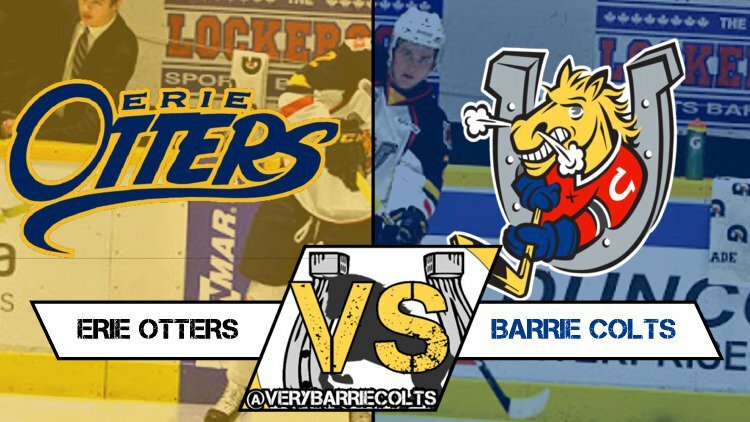 Last night the Barrie Colts were in Erie to face the Otters on American Thanksgiving. Barrie had a lot to be to be thankful for; The return of Ben Hawerchuk, Jake Tortora making his OHL debut and earning the win! Here are the highlights from the Barrie Colts 7-5 win over the Erie Otters. Lucas Chiodo 1 goal and 1 assist. Aidan Brown 1 goal and 1 assist. Jet Greaves 8 saves on 11 shots. (r) Kai Edmonds 16 saves on 18 shots. Next Game is tonight @ Niagara IceDogs. 7:00 puck drop.